Will the Republican brand affect midterms and who has upper hand in 2014 races? Dan Malloy, Haley Barbour, Gwen Ifill, and Jackie Calmes break down the V.P. 's town hall advice to women on self-defense. Dan Malloy, Haley Barbour, Gwen Ifill and Jackie Calmes discuss the likelihood of passing immigration reform. Gov. Dan Malloy (D-CT), Former Mississippi Governor Haley Barbour, Gwen Ifill from PBS, and Jackie Calmes of the New York Times consider who will take the blame if budget cuts go forward. 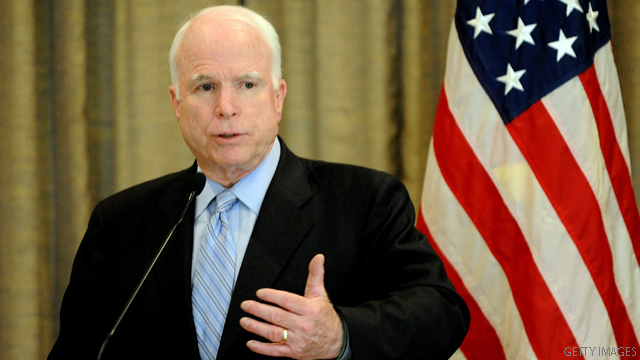 Senator John McCain (R-AZ) joins us with the latest on the negotiations to avert forced budget cuts. Plus, Transportation Secretary Ray LaHood on the effect the forced budget cuts could have on his department and your travel. Then, Senator Patrick Leahy (D-VT) met with Cuban leader Raul Castro this week, and he’ll be here to discuss the negotiations to release American contractor detained in Cuba since 2009 Alan Gross. We’ll also ask him if there’s any movement on the five- decade-old US Embargo of Cuba. And our panel this week includes Gov. Dan Malloy (D-CT), Former Mississippi Governor Haley Barbour, Gwen Ifill from PBS, and Jackie Calmes of the New York Times. Watch Sunday 9am and noon. Mississippi Gov. Haley Barbour shares his thoughts on the 2012 GOP field and whether he thinks there is room for more.